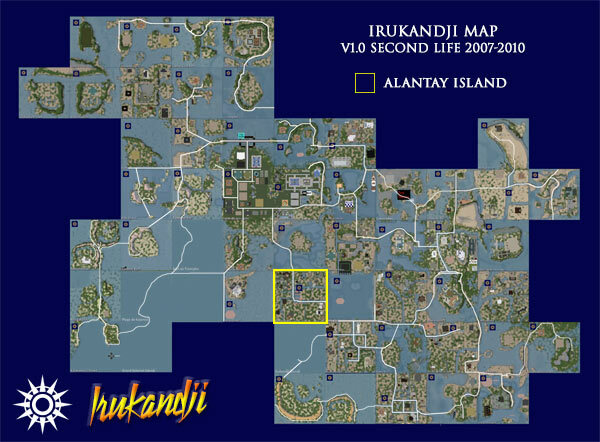 NOTE: This page is about Alantay Island in Second Life. 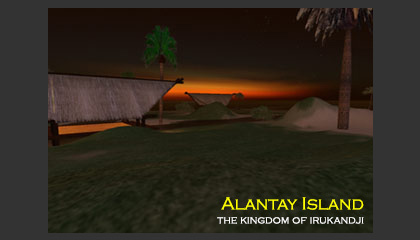 The InWorldz version is here: Alantay Island in InWorldz. The sixth sim that i built on the Irukandji continent in Second Life, Alantay Island was terraformed by hand, and was online just short of three years between 2007 and 2009. Its design is a low lying atoll, criss-crossed with canals, which made the parcels appear to be small islands unto themselves. Alantay Island also featured a marina and waterfall playground. Alantay Island was the second sim on which I offered land for sale. Its existence came about primarily because i wanted to boot the tenants off Tamita Island and keep it for myself. I subdivided Alantay Island and sold the parcels for 22L per square metre plus rent. This was a very high price for land, but regardless, it sold out in 2 weeks. At the time, this was an SL record and Alantay's popularity spawned several new islands afterward which enjoyed similar success. At its peak, Alantay Island supported a population of around 60	people from USA, England, France, Turkey, Italy, Germany, and New Zealand. Land rarely changed hands on Alantay Island and when it did, the properties sold for a premium. In early 2008, one particular 4096 sqm parcel which was sold privately between land owners, changed hands for $1250 USD - not game dollars but USD. That was the type of money being thrown around in-world for quality virtual land before the GFC. Alantay Island was extremely popular and there have been few islands to match its cult following since. The majority of Alantay's residents remained there throughout its entire life. 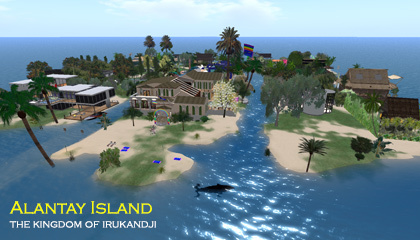 During Alantay Island's next incarnation on the InWorldz grid four years later, it would again prove popular with residents, but never like the halcyon days in 2007/08. Neighbouring islands clockwise from west are Bay of Plenty, Crystal Atolls, Baie de Citron, Nouvelle Kiribas, Tamita Bay, Pinjarra Island, and Irukandji Sound. Although I haven't yet written about Alantay Island's tribal and colonial history in detail, the background story goes that during the 1890s, the entire native population of Alantay Island were taken into slavery to service the sugar cane farms of Australia and Fiji. A reference to their plight is mentioned in the article Tale of the Twin Pearls. Below you will find more photographs of Alantay Island that I took during my travels around the islands.